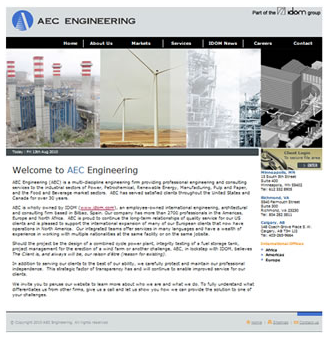 Web Site Design – Our agency designed, programmed and produced a custom web site that presents AEC as is a multi-discipline engineering firm providing professional engineering and consulting services to the industrial sectors of Power, Petrochemical, Renewable Energy, Manufacturing, Pulp and Paper, and the Food and Beverage market sectors. The website is responsive, visual and allows customers to utilize their site to review specific products and services for their respective marketplace. The agencies creative team produced various concepts and layouts before programming the final site. Our agency selected brilliant and colorful energy photographs that helped define the specific niche markets they service. We also implemented a simple and responsive content management system that allows for easy updates to the site. The site is hosted and powered by the implementation of our strategic SEO services. Our integrated strategy includes content analytics for future company analysis on their products for future studies and web updates.